some EXCITING news and some SAD news! Once again, BALANCE. Quite AMAZING how all of that works! My VERY dear, dear friend "T", owner of ONE SINGLE SEED and preparing for it's GRAND OPENING (site formerly known as Treasures To Scrap where I have PROUDLY hung my designer cap in the past) next month has shared some VERY, VERY exciting and MIRACULOUS news with me (she has posted on her blog too!). Some of you may remember back last year, almost a year now, when I blogged about Tracy's SIL, Trevor who was VERY, VERY ill and in need of a kidney and pancreas transplant. I hosted a slideshow of layouts LOVINGLY created using the FABULOUS charity kit created by TTS designers and friends and would ALWAYS check Tracy's blog for updates on how Trevor was doing and just hoped and prayed his needs would be met and then one AWSOME day, Tracy IM'd me and told me the MIRACULOUS news about how Trevor was supposed to have been removed from the transplant list due to hospital politics, but that the nurse in charge of doing so, DID NOT, so that when Trevor got real bad again and measured up to their criteria once again, he was at the TOP of the list and received his transplant and has been recovering nicely ever since! So, what's the EXCITING news you ask? After being told by doctors that he would most likely NEVER be able to produce children due to his diabetes and surgeries, he and his wife, "T's" daughter, Savana are PREGNANT!!!! WOO HOO!!! Is that not just the kind of news we ALL love to hear??? It surely is! I am SOOOOO very happy for the ENTIRE family! 'T', I hope I explained everything accurately as I'm going by memory and we know how that goes at this stage of my life!!! LOL! Correct me if I boofed, K? I love you girlie! Follow me on over to Tracy's blog y'all and help me in congratulating her and the family for this MOST incredible news!!! Balance. That means that with the happy news comes some sad news and blogging about it right now is allowing me to cleanse it from my system. This is my FIRSTEVER bittersweet moment in my nearly 55 years of life. Truth. My sweet baby girl was handling this in a different manner than most of us who shout from the mountain tops, "I'm PREGNANT", just as soon as we find out, however, in speaking with her tonight, I really feel that she instinctively knew that something was not right as she kept telling me that she was not going to make a BIG announcement until she had her first ultrasound and saw the baby. Well, bless her precious heart, she just had her first ultrasound and there was no fetus found. My heart just broke for the both of them. Joan never even so much as quivered while speaking with me and then I started crying and felt bad as I did not wish to get her started. She told me that she had already had several good cries and that she is at peace and it simply was not meant-to-be at this time. She was being so stoic and she explained to me that it was Travis who really took it hard as he had NEVER once prepared himself for this kind of outcome, where Joan had. There's the balance again. ALL things for a purpose. Joan called me right after she arrived home from the hospital where she underwent a D & C and was feeling NO pain! I wish I could have been there to wrap my arms around her but she has such an INCREDIBLE husband who is doing a MOST wonderful job of supporting her. She said that they will take it day-by-day, which is all one can do. My daughter, age 29, is wise beyond her years, as is her older sister. They both AMAZE me. I told Joan that she has such understanding SO much earlier than I ever did. But then, we were raised differently and I think that accounts for a lot of it! Things have certainly changed as the doctor told them to wait a good month and then they can start trying again! WOW! It used to be a good six months or so, didn't it? AMAZING the progress we've made. I hope y'all have a VERY nice and laid back weekend. Any EXCITING plans??? Anyone going away for the weekend? Starting a NEW project? Finishing one up? Spring is just around the corner and then it will be time for us on this side of the globe to start working in our gardens, mowing the grass, pulling weeds and some good 'ol SPRING CLEANING around the house! How is everyone??? 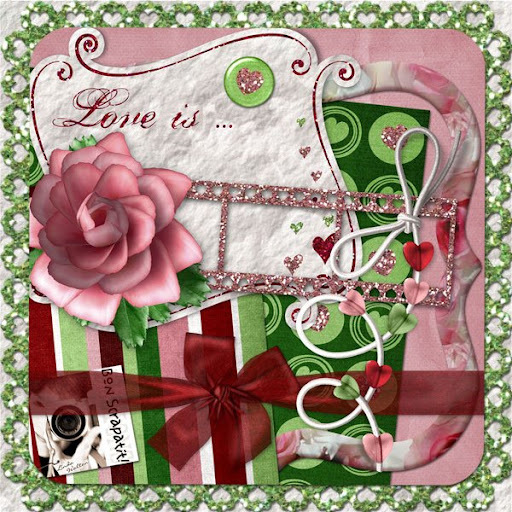 I was supposed to leave you with a goody yesterday from my dear friend and CT member, Carole Nordyke and we discovered a little glitch that was on one of the elements, so we determined it not to be an A-1 item and will work with my new kit instead as the "scrapatit" was made with *Forever Mine*! I am working on a VERY, VERY special project at the moment! You know how sometimes things just drop out of the sky and land on you??? Well, something has and I am VERY excited! Have a LOVELY evening, night and/or morning and I'll be back in a few hours to post tonight's goody! ROFL!!! Okay, I'm a poet AND I know it! Could not resist! I am about to watch the sun rise unless I get myself to beddy-bye, SO I am leaving your goody for today and saying GOOD NIGHT, GOOD MORNING and have a SUPER SUNDAY y'all!!! SCRAP HAPPY! I will be back in my morning (PST) to leave you with another little special something created my the WONDERFUL Ms. Carole Nordyke and there is still MORE of *Love Is* to come! to let y'all know that I will be back later tonight with Part Two of *Love Is*! I am SO happy that you like it and I wish to thank you for the SWEET messages and the LOVELY "welcome back's"! I have SO missed SCRAPLAND and CYBERLAND in general. I just spent more time than I had planned catching up on Facebook and I still have MUCH more to catch up on. I had to catch up with my "real life" family too! Now it's time for a dinner break! Mmmmmmm ... I am famished! I am VERY, VERY tired tonight and this being my first day back on the computer in about five days, I have SO much to catch up on and SO much to share, however, I shall have to wait for the next post or two while I get things sorted on my end and am feeling up to sitting here at the computer for a longer length of time! I, again, wish to thank you ALL for your LOVE, comfort, support, poems, shares, thoughts, well-wishes and prayers during this difficult time of family loss. 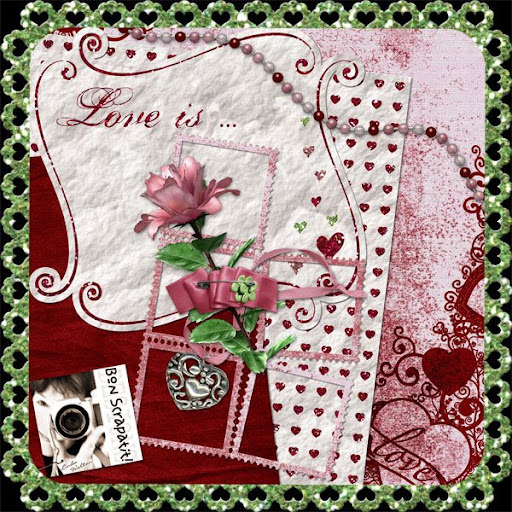 I simply cannot put into words ALL that I feel, so I hope you know that I've been thinking about y'all every day while away from Scrapland as I leave you with a slightly "belated" Valentine's Day gift simply titled, *Love Is*! Y'all can fill in the blank! Here is one from me - LOVE IS .... ALL of my VERY, VERY dear and sweet digi-sisters in Scrapland who come to the aide of their fellow digi-sisters in a special time of need. MWAH! You will also find TWO download links - one for the CANDY JAR if you are able to successfully download and like it LIGHTNING FAST! The second is via 4-SHARED for those unable to do so via the Candy Jar. 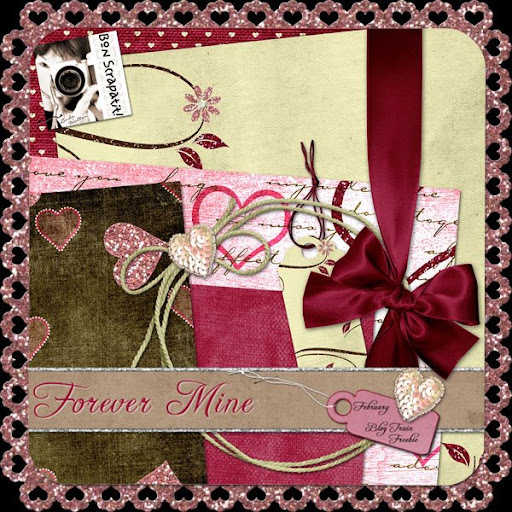 Just a quick reposting of my *Forever Mine* Add-on via 4-shared for those who were not able to download via the CANDY JAR! I thought it best to add this as an extra post since many of you, like me, follow a blog roll and follow up on someone's newest post. I have just read through some of the additional comments on my last post and have noticed that a few of you have not been able to download from the new CANDY JAR at Digital Candy. I will try my best to come back in and post a 4-shared link for those of you who are having difficulty and in the future I shall post two links, one for 4-shared and one for the Candy Jar until I can ask Rick at DC if he might know why a few of you are not able to download. ASTRID - I have used Firefox FOREVER (not exaggerating) and have NEVER had downloading issues. That is actually why I converted to Firefox when beginning my adventures in SCRAPLAND. I could never download freebies from our chatroom and some one enlightened me to Firefox and we've been a team ever since. I might ask if you have updated to the most recent version? I've had a few updates come through over the past couple of months and having had a bit of an issue with them a while back, I went to their website and downloaded the newest version which I did not have. WHOA! I could NOT believe the difference in the speed of my downloads. Or, could it possibly be a firewall or securtiy issue with a new site? HAPPY BIRTHDAY TO MY BFF AND A PRESENT FOR Y'ALL!!! It really is AMAZING how everything is balanced. I know we strive to keep our lives in balance, but if you really think about it, they are as we are on a path of learning throughout our lifetime and part of that is striving to keep ourselves on an even keel. I always think about the "earth" on it's "axis" and how PERFECTLY balanced it was designed by our Creator. We have night and day, right and left, up and down and so on and so forth! How did this all come about you might ask? Well, my thoughts at the moment are that while our family will be grieving the loss of a loved one, we shall also be celebrating her life and the time we had with her and also rejoicing that she is in a MUCH better place now! 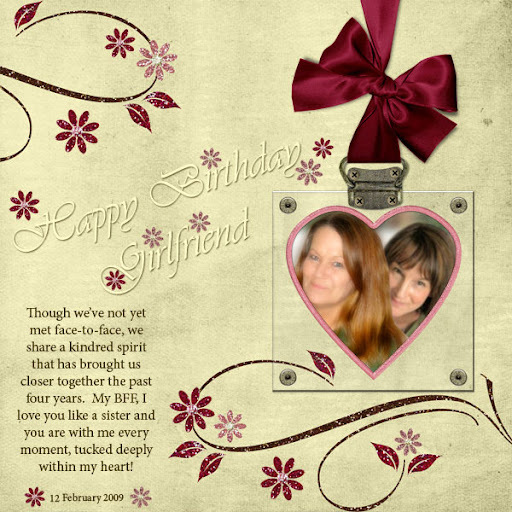 Today is my BFF's birthday! HAPPY BIRTHDAY GIRLFRIEND!!! Dawn (Snowsmoon's Design) and I, after four years of friendship that began here in the digital scrapbooking community, have yet to meet in person, however, she is as close to me as a sister if not even more so! So, I have created a little layout that brings the two of us together in HEART and while I did not have the time I would like to for it to really look like we are sharing a photo together, I shall redo it for you girlfriend (I just received Joan's oringinal-sized wedding photos on DVD) and then send you the full-size image for printing if you choose to do so! I am going to print a copy for myself and frame it!!! You ARE part of our family now, remember? LOL! Love ya girlie and I hope your day is FULL of LOVE and LAUGHTER and ALL things GOOD sweetie! I am awaiting a newspaper clipping that one of Robert's employee's brought to him this morning as I wish to use it in a memorial layout for Elise and to share with the family. WOW! This just reminded me of a memorial layout I did for Robert's mother to give to all of his siblings and some extended family. 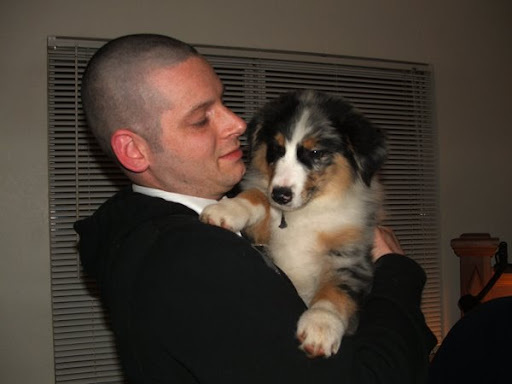 I hadn't known him very long at the time and this was before I found digital scrapbooking online! Yeah, you know, back in the dinosaur ages! ROFL! 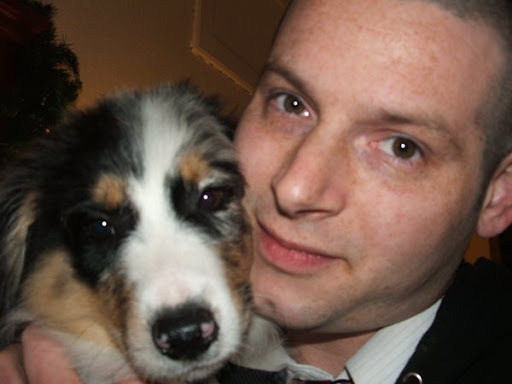 It really seems SO very long ago now, but it was about seven years ago I believe. Anyhoo, I love to write poetry and for me it comes in seasons. I've been a VERY dry season for a long time now, but I know it shall return to me in it's proper timing! *smile* I will have to share the layout with y'all sometime. Right before beginning this post, I had just received the, hopefully, final family update on Elise and her return to the US. They have had to change arrangements on this end a few times already, but we are hoping this to be the last as Elise is due back in the US her mom and mom's husband this evening. Services will be held tomorrow, which as I've mentioned in a previous post is also the anniversary of the passing of Elise's grandmother, Robert's mother. There is one other interesting fact that has been noted in the last update. Elise is arriving on flight #976. Her younger sister and only sibling realized that there was GREAT significance to those three numbers. (9) - Elise was born on the ninth day of June. (7) - Lucky "7" was Elise's favorite number. (6) - Elise passed away on the 6th day of February. It was noted that this was a sign to the family that all should go smoothly from this point on. I stand with that! Thank you ALL again for the continuing thoughts and prayers. You just HAVE to know they help and Sarah, I admire the fact that you help counsel those who are grieving a loss. Having a support system is SO important in getting through any traumatic situation whether it be family, friends, church, a support group or some where positive to plug into. No one should ever have to go through grieving alone, although I know there are those who find it necessary for a time. As I always tell my family, LOVE heals and I believe that with EVERY beat of my heart. If y'all would like to join me in wishing Dawn, Snowsmoon's Design, a VERY "Happy Birthday", join me over HERE on her blog and let's leave her some GOOD 'ol SCRAPLAND lovin'!!! I most likely will not post tomorrow unless we arrive home at a fairly early hour tomorrow night. I wish you ALL a FABULOUS weekend and I hope you enjoy the small gift I am sharing with y'all today in celebration of my BFF's birthday!!! Gosh, I always feel a little strange when I've not touched bases with y'all at least ONCE per day!!! SHEESH, you'd think you were my family or something!!! ROFL! YOU ARE and I've missed you!!! I am going to get all weepy-eyed here as I type to once again than you ALL so, SO very much for your support of our family at this difficult time. We were just recently updated on all of the details and while I thought the family was vacationing in Mexico, it turns out that they were on a Carnival cruise (I've been on before so I can see things pretty clearly in my head) when Elise became ill. When they docked at a port in Mexico, they took her to a hospital. Seeing as how they did not have the ability to help her, they were going to medi-vac her to a hospital in Chula Vista. She did not make it. The family update today is that Mom and husband are still fighting the Mexican government to release her body for return home and that today, they have actually now involved the American government to help expedite the process and we are all hoping for an answer later today as to when to expect them. Arrangements are all tentative at this time and I can only imagine how difficult this is for Elise's parents. Thank you, thank you, thank you for ALL of the thoughts, well-wishes and prayers. I also thank those of you who have shared special poems. I would also like to take this time to express my sadness at the loss of homes and lives in Australia as they continue to battle the worst bushfires in their history. This has a little extra special meaning to me as I reside in California where we deal with horrible fires every year and the past several years have been quite devastating. Australia has sent over firefighters to help on several occassions that I know of and am EVER thankful for their generosity in doing so. While I do not watch the news on a regular basis, I sit here not knowing whether or not we have reciprocated the generosity, so if y'all know, please tell me! I surely hope so. My heart, my thoughts and my prayers are with ALL involved and it is my hope they are able to contain these fires VERY soon. Last I read, they were pretty positive that someone deliberately lit them. I hope they are able to find this person/persons ASAP. So, SO very sad. On a MORE positive note, I had a MOST incredible visit with my grandson, Kaleb yesterday! He was just the medicine the doctor ordered for Grandma! Are y'all ready for Valentine's Day??? Any SPECIAL surprises you have planned for DH? Ooooohhh, I just bet some of y'all are going to be NICELY surprised as well!!! I'd LOVE to hear your stories of special LOVE! Anyone have special traditions they celebrate? When my children were small, I always surprised them with a dining room table full of LOVE and a special Valentine's cake in a heart-shape. With economics as they are at present, it might not be a bad idea for me to start that tradition up again! It is VERY easy on the pocketbook! I am in the midst of upgrading my Photoshop and as soon as I've all squared away, I shall have a GOODY for y'all and some photos to share! Nancy, my sweet friend from CT, you are EXACTLY on the money girlfriend! You don't know how much I've thought about YOU and others with Lupus as I am really realizing how weakened the immune system is and YES, that IS what happened to our Elise. She picked something up in Mexico and her body was not able to fight it. Robert spoke with his brother yesterday morning and you just KNOW that no matter HOW hard you try to keep it together, when you hear the person's voice or see their face, the flood gates open wide! In one breath, Robert spoke his brother's name and the next he burst into tears. Elise's body will arrive her in the US on Tuesday and they are thinking Friday for her service. We just found out a bit ago via one of Robert's younger sisters that Elise passed away in her mother's arms. As a mother and as most of you are, I see this two ways -VERY emotional and traumatic for Elise's mama, yet VERY comforting for Elise. The two have always been VERY, VERY close. Robert told his sister that God took Elise home because he needed another angel! He also brought to my attention that if Elise's funeral is indeed on Friday, it will be the same date that his mother passed away in 2000. When I came in to check my blog today, I read through each and every comment and became VERY tearful about halfway through as I am, once again, reminded what a MOST incredible place SCRAPLAND is and just HOW many loving and caring people reside here! Hey, we really do ya know - reside here! It's almost like Alice stepping though the looking glass into WONDERLAND. I sit down every day and look through my computer screen into SCRAPLAND and admire ALL of the GORGEOUS people that visit each day! ROFL! No MADHATTER, just a bunch of MADSCRAPPERS!!! LOL! See, I am laughing .... good to do as much of it as possible in these situations ya know. As one of you have shared with me the loss of two of your own children at MUCH younger ages, laughter does help us to get through and to carry on. It TRULY is the best medicine! Thank you SO very much for sharing your OWN stories, for your kind words, wisdom, thoughts and prayers. The trauma for Elise's mom is above and beyond the loss of her eldest daughter, we have also been informed that Elise was in the company of not only her mom and her mom's husband, but also her grandparents and an aunt, possibly more. Anyhoo, I am hoping and praying for all to be quickly reunited. It was reported to us that ONLY Elise and her mom were returned to Mexico and that the rest of the family had to stay on the boat headed for San Diego. This leaves Mom all alone (physically!) and in a country whose language she does not speak. Word has it that just as soon as the boat reaches land, Mom's husband is on a plane back to Mexico. I SO hope and pray that ALL goes smoothly from there. Today, I have a little add-on for you to my contribution to the *Forever Mine* blog train. I have searched and searched to find who it was that had asked about the heart-punched and scalloped matte that I used in the preview and I've not been able to find it. Anyhoo, I am not giving it to you in it's glittered state but in a more neutral state so that you can easily recolor it or cover it with a paper of your choosing OR you can add your own glitter style! Some of these are pieces I had leftover when creating my portion of the train! *If reading what I've written seems pieced together, it has been - *smile* I started this last night, but was not feeling well so I started again this morning! As you can see, it is now early evening my time and I'm just finishing up! I've had some digestive issues and can't help but think they may have been kicked off by the news of Elise's passing. I have to keep my stress levels at bay as they affect my digestive system something horrible! I can only sit so long and then I HAVE to get up and move around! Please forgive me if I sound scattered as I simply am struggling to focus today. Have a MOST beautiful weekend ahead y'all and thank you for visiting me and being your WONDERFUL selves! MWAH! Well, it is REALLY raining here in California today and most all of us know it has been desperately needed, however, I think I've cried MORE tears than I've seen raindrops today. Thank you for the uplifting and positive comments in regards to the successful outcomes of both family surgeries this past week. I was SO lighthearted, upbeat and EVER thankful this morning! I watched a touching set of events on the television that was left on when the guys left for work this morning. I shed tears, but they were tears of joy while watching some incredible acts of humanity. I then called my BFF, Dawn, before getting started with my day on the computer. We touched on a variety of subjects and then the last part of our conversation was about our children. Not long after we said our good-bye's, I called Robert at work to ask him a question. After our conversation ended, I was just settling down to start work on the computer when he called me back but rather than from his office phone, he was calling from his cell phone. Mind you, Robert is a practical joker and has been known to impersonate other people and such to throw me off, so the first thing I asked him was where he was? He was in his office. Why are you calling on your cell phone? I have some VERY sad news. I knew he was being serious. I could hear it in his voice - a slight quivering. Elise passed away this morning. What? NO! We both cried together. Elise, our SUNSHINE girl, Robert's older brother's oldest of two children. Elise was a tower of strength and a great source of inspiration for the entire family. We watched her go through experimental and aggressive treatment for Lupus, which she was diagnosed with at age 17. She was told there was a risk of her not surviving them. She not only agreed to being a guinea pig, she survived them all! Several years ago Elise was diagnosed with cervical cancer and, again, she fought and survived after finding the "right" doctor. Elise ALWAYS had a BIG smile on her face. Hi Uncle! Hi Auntie! How are you? I could go on and on y'all. This was a young lady who not let you feel sorry for in the least. In fact, I just mentioned to a designer friend that when engaged in conversation with her, you'd think you were the one with the illness! Elise was a sharp cookie - intelligent, humerous, well-spoken, wise for her years, sweet, LOVING and SO accepting of everyone. Without having ever met Robert's mother, Elise is very much like her in the way she treated others. Robert's mother NEVER turned anyone away, neither would Elise. A VERY tight family. Elise was the first born amongst Robert and his siblings, Poppa's first grandchild. My heart grieves and my thoughts and prayers are with the entire family as some of them gather together tonight. Elise, as far as I understand, did not pass away from complications of her already established illnesses, but from her visit to Mexico with her mom and her mom's husband. Things are still a bit sketchy but they were trying to transport her by boat to a hospital in San Diego and she did not make it. Apparently, she just became ill. At this time, they are working on getting her transported back here to Northern California and I am sure they will have to go through certain procedures before being able to do so. I pray all goes smoothly. Elise NEVER complained. How many times we would discuss her incredible strength and how it left us with no room to. Elise, you shall be missed terribly sweetheart. We know you are in a much better place and at peace baby girl. We love you Sunshine! Thank you for letting me share with y'all. I've learned as I've gotten older and have been through some of my life experiences that talking about things helps so much in the healing process. Today, is Go Red For Women. I am a survivor and have a story to tell. After the news this morning, I never made it in to don my red shirt or to copy and paste my story. I just couldn't do it today. I will share another time. Give someone you love an extra squishy hug this weekend ... I am leaving one for y'all! 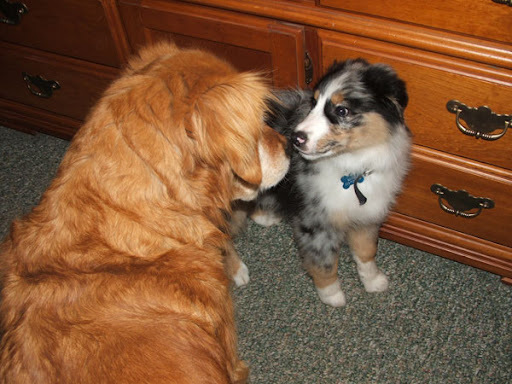 Tink - I am SO happy to hear that Scamp does NOT have meningitis. Did they ever figure out what was going on with him? Lucy - I will look that potion up for the gallbladder, thank you. Before I had an abdominal ultrasound to discover that I, indeed, do have gallstones, I had found one in my book, Prescription for Nutritional Healing that consisted of extra virgin olive oil and freshly squeezed lemon juice. Pretty close, eh? I do know that there are also gallbladder cleanses out and about as well. P.S. I am using a different file sharing resource tonight and for the VERY first time! Rick, half of the new ownership of Digital Candy has installed something new called the CANDY JAR! We can upload and store our files there just like on 4-shared. Now, my understanding is that this is available to anyone, so I will work on getting you some info and posting in a subsequent post! Sound exciting? WOO HOO! Let me know how the downloading goes for you. The uploading was INCREDIBLY fast! I was uploading at over 1 MB/sec! WOOOOSH ... went to reheat my coffee and it was finished when I returned! Now, there is no place to leave comments and as soon as you click on the link, a download window appears. I figure in the time saved by not having to wait for 4-shared's countdown, y'all can leave me a comment right here on my blog! *wink* Y'all just have to know that your LOVE and KIND words fuel my MOJO, right? Uh, huh! MWAH! I've been busy putting out little fires here and there and learning my way around my new digs at Digital Candy! But before I talk about anything else, I wish to give you a couple of updates on our family surgeries! Thank you SOOOOOO, SOOOOO much for ALL of YOUR well-wishes, thoughts and prayers. Y'all ALWAYS knock my socks off with your LOVE and KINDNESS! Robert Jr. arrived home YESTERDAY from the hospital and is progressing nicely! He is to take six weeks for recovery. No heavy lifting, etc. Y'all know that routine! Same, same as anyone who has either had the 'ol school gallbladder surgery OR a C-section! Tender, tender, TENDER!!! Well, I can ONLY imagine as I've not had either, but from watching all of the Dr. G, TLC and Discovery shows - OUCH! 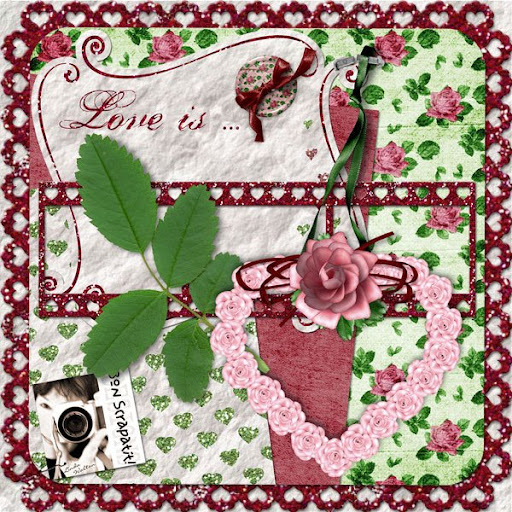 This evening I have two more Valentine's Day cards for you created by my dear friend, Carole! 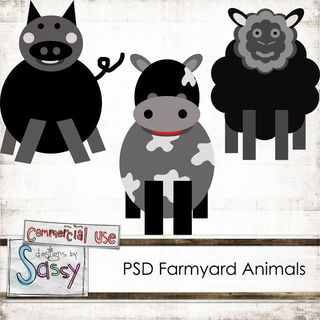 Of course, these are made with my *Love Me Tender* scrapkit, which is on sale through Saturday at my NEW store at Digital Candy for 30% off the regular price!!! 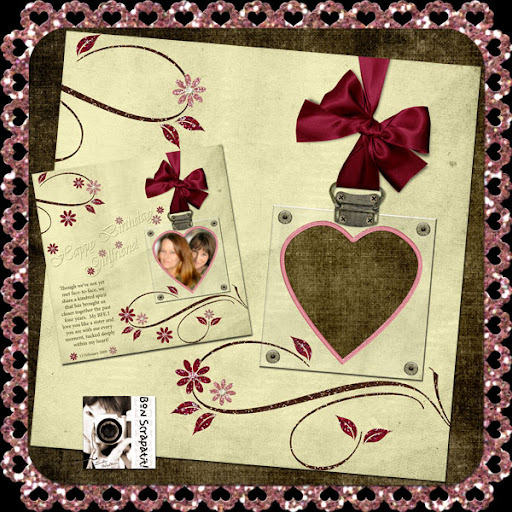 I'd like to thank ALL of you who have recently uploaded layouts and/or cards to the guestbook! Oh, such GLORIOUS eye candy for me to behold each day I log on! WOO HOO! Danyale - I shall reply to your e-mail ASAP, but just letting you know I got it girl and thank you SO very much!!! MWAH! Most of you snagged *Love Me Tender* while posted here on my blog for FREE, but if you happen to have missed it, you can still grab it for a GOOD price HERE! The sale price will be reflected as you check out with your shopping cart! WHEN IT RAINS, IT POURS AND OUT COMES THE BIG UMBRELLA ... AND A GOODY FOR Y'ALL OF COURSE! He, he ... Hi y'all!!! I've been quiet the past couple of days! Okay, be nice! ROFL! I've got a few things to catch you up on and then I'm taking the bull by the horns! I'll let y'all guess who or what the "bull" is! LOL! Firstly, Robert's oldest son and his name sake, is in the hospital. Without going on and on and on, which we ALL know I can do VERY easily, I will tell you that he is doing okay. Robert Jr. was HORRIBLY misdiagnosed with ulcers, put on antacids and was in SO much pain last Thursday that he had to pull off to the side of the road, call his younger brother who works for the same company, to come and pick him up and take him to the ER. Turns out, Robert Jr. had a highly infected gall bladder that had caused for elevated liver enzymes and they had to get that under control before operating to remove the gall bladder. Robert Jr. just celebrated his 30th birthday the one month ago today, bless his heart. Anyhoo, they are keeping him 4-6 days to make sure there is no infection. They ended up having to do the full procedure for removal because the gall bladder had literally fallen apart. It was in VERY bad shape and they are watching him closely to make sure his liver is okay and has not suffered damage due to the toxicity of the gall bladder. What REALLY boggles my mind is that TWO doctors determined that his young man had ulcers when he tested negative for Helicobater Pylori, which is the root cause of peptic ulcers and he had spent an entire night in severe pain with continuous vomiting for nearly 24 hours! HELLO!!! Even I would say, hey, I think it's your gall bladder! Even Robert Jr. had started doing his own research, sheesh! So, we now have dear son number one recovering in the hospital and another family member is scheduled for surgery on Thursday. I also have a SIL on my side who is battling her third round of breast cancer. When I say "it's pouring", I'm not kidding. SO, I bring out my BIG umbrella!!! 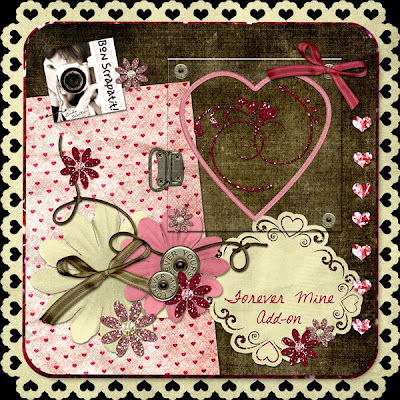 My VERY dear and LONG-TIME friend and now CT member, Carole Nordyke, has created a set of four Valentine's Day cards for us using *Love Me Tender*. Thank you Carole, they are VERY lovely and will come in VERY handy for this girl! NO thanks to me y'all, but you can leave some Scrapland lovin' right here for Ms. Carole! She is just the sweetest and one of the CRAFTIEST ladies I know! We all used to refer to Carole as the CRAFT QUEEN at 3Scrapateers! Tonight, you will receive the first two cards and I will post the final two tomorrow. Carole also has a BEAUTIFUL scrapatit for us, which I will post by week's end as I still need to post the *YOU* acrylic frames and some hangers! LOL! We'll just have to wait and see which comes first! In the midst of this, I am working on getting my store set up at Digital Candy!!! YES! I am NOW officially a CANDY GIRL - WOO HOO! They are already CELEBRATING their RE-GRAND OPENING and I'd LOVE for you to take a trip on over and check it out. I will be making some changes on my blog throughout the week so as to keep you informed as to what is happening in Candyland here in Scrapland! There will be some AWESOME challenges in the forum, there is a raffle going on for a $50 certificate to the DC store AND right now through this Saturday, February 7th, EVERYTHING in the Digital Candy store is 30% off! That's right, 30% will be subtracted from everything in your cart at checkout! WOO HOO! This girl just LOVES a GOOD sale and you can bet I'll be doing a little shopping of my own! I've already made a list even! Check out the store HERE. The new owners, Rick and Kate are AWESOME and they are SO passionate about Digital Candy and scrapbooking that they have had their Bronco detailed!!! You can see photos HERE! WAY too sweet! I am MOST honored to be working along side of some INCREDIBLE designers and I will be posting a blog roll with each of them listed so we can keep tabs on their freebies and sales as well! CLICK HERE TO DOWNLOAD TODAY'S GOODY! ALL ABOARD!!! THE FEBRUARY DST BLOG TRAIN IS NOW DEPARTING! WOOOO, WOOOOOOOO!!! Here we go y'all!!! The February DST, *Forever Mine* Blog Train has NOW departed and is pulling out of the DST forum and headed for it's FIRST stop! Below, is a slideshow of MOST all of the contributions. There are SO many designers that ONE preview was an impossible feat, so Trish, one of the coordinators of this month's blog train, put together a LOVELY slide presentation for us! Thanks Trish! Here is the link to the Blog Train Blog. You will find ALL links posted to each contributing designer's blog. My thanks to ALL designers who have participated - y'all are TRULY amazing! Let's make sure to leave them ALL some SUPER SCRAPLAND lovin'!!! ENJOY! CLICK HERE TO DOWNLOAD MY BLOG TRAIN GOODY!